Life's Journey To Perfection: Family Home Evening- My Gospel Standards: I Will Dress Modestly to Show Respect for Heavenly Father and Myself. Family Home Evening Outline for: I Will Dress Modestly to Show Respect for Heavenly Father and Myself. Scripture: 1 Corinthians 3:16-17 "16 Know ye not that ye are the temple of God, and that the Spirit of God dwelleth in you? Have everyone stand up and place their hands on their head, then shoulders, then knees and then toes. Ask them if they feel like they have passed the modesty test. If not, discuss ways they can change their wardrobe so they will. Discuss ways as a family that we can make sure we dress modestly. Maybe when we purchase clothing we can do the head, shoulders, knees, and toes experiment ourselves. Read: "Modesty" Emphasizing that our bodies are sacred, because they are God's creations. Pass around a mirror to each family member. Have them look at the mirror have them think in their mind: I am a daughter/son of my Heavenly Father. He has made my body in his image. It is the temple of my spirit. 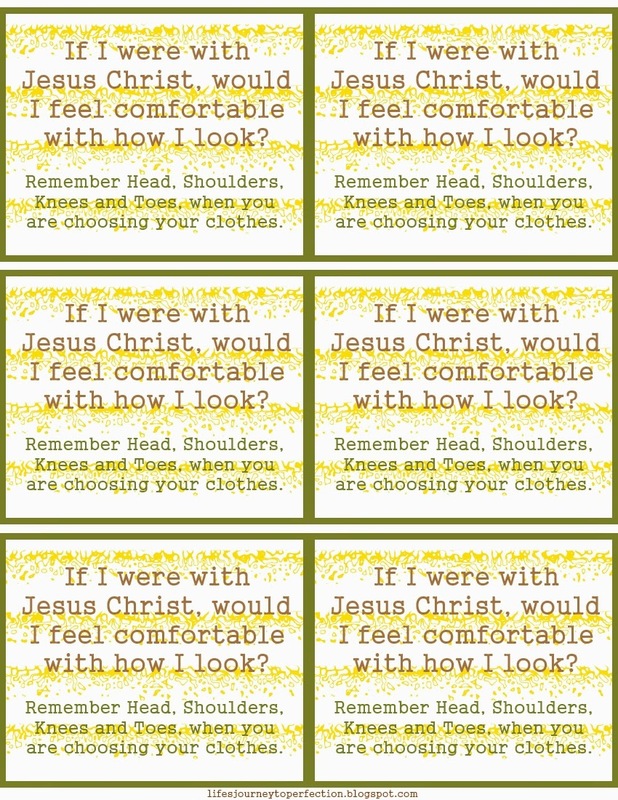 Read: "Remembering Modesty" found in the April 2012 Friend Magazine. Discuss the guidelines we have been asked to follow to dress modesty. Give each family member the modesty reminder handout. Choose your families favorite kind of cereal. In a microwave safe bowl, combine 1 (10 oz) package of Marshmallows and 3 tablespoons of butter. Heat in microwave on high for 3 minutes, stirring after 2 minutes. Stir until smooth. Now, add in your 6 cups of your favorite cereal. Stir until cereal is coated well. Press into a 13x9 inch pan that has been sprayed with cooking spray. Cool and cut into squares.